The development of brown leaves or dieback of shoots on a much valued specimen can be alarming, but does not necessarily mean you will lose the plant. More often than not, brown leaves, dieback, wilting and leaf drop are caused by weather damage; such as drought, waterlogging, snow, frost or hail. Damage caused to garrya by cold weather. Credit:RHS/Advisory. Most trees and shrubs have a few leaves that suffer damage or disfigurement during the growing season. Often our first thoughts are attack by pest or disease, but many times it is due to the weather. Unfortunately the symptoms of weather damage are often similar to those caused by pest, disease or nutrient deficiency. And in some cases, the symptoms from weather damage might take weeks (or months) to show up in a plant. When all leaves uniformly turn yellow or brown, the cause is most likely to be one that affects roots and water, or nutrient, supply. Drought: In dry spells, roots cannot gather sufficient water to sustain the foliage. Leaves start to wilt first, followed by leaf and bud loss, and ultimately die-back of shoots or whole plants. Parts of the plants furthest from the roots are usually affected first and most severely. Newly planted climbers, shrubs and especially trees are at extra risk because their root system takes several years to develop to the point where they are drought-proof. Do remember that root diseases cause similar symptoms. Sun and high temperatures: As well as water loss, excessive sunshine and heat can lead to scorched areas of leaves, typically on the sunny side of plants and not on the lower leaves, those within plants or on the shaded side. Woodland plants such as Acer palmatum are especially vulnerable to sun damage but many plants can suffer high temperature damage after a heat wave including camellia and Lonicera. Typically brown patches appear on leaves and, in the case of apples, fruit on the most exposed side of the tree develops a reddish-brown burnt patch which often has a flattened appearance. Where leaf scorching is seen after watering in bright sunlight the cause may be due to the water droplets focussing sunlight on the leaves causing burnt areas. Smooth leaves are unlikely to be affected as research suggests that the light from droplets on the leaf surface is not focussed on the plant tissue, and water tends to run off smooth surfaces. Hairy leaves may be damaged as the water droplet is suspended over the leaf and the light from these suspended droplets is considered more likely to be focussed on the leaf tissues causing damage. Flooding: Soil filled with water contains too little air for plant roots to thrive. In winter when plant roots are dormant they can survive quite long periods of flooding, but in summer when the water demand of roots is high, even short periods of a few days can be fatal. Heavy rain: Tends to affect the top of plants with rain damage breaking delicate shoots and flowers. However it is soil saturation and flooding that causes most harm. Frost: Also tends to affect the top of plants where the freezing is most intense. Lower leaves and areas inside the leaf canopy are less affected. Frost can damage plants randomly in an affected area with some plants losing buds, foliage, flowers and fruits and others being unaffected. Snow: As well as freezing damage, mechanical damage is caused by the weight of snow breaking branches. Hail: Causes bruising and abrasion and occasionally defoliation or loss of fruits. Hail causes tiny scars on young leaves and fruits that become very noticeable as the plants develop. Hail damage mainly affects the top of plants. High winds: Cause damage to the upper and windward sides of plants. In severe cases plants can be uprooted. Windy weather also dries out leaves leading to browning, scorching and loss of buds, flowers and leaves. Ensuring plants are healthy and not stressed will go some way in minimising weather damage. 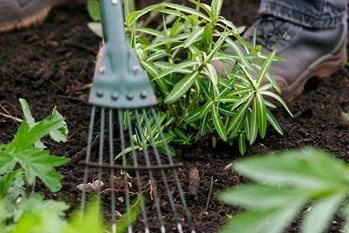 Follow our advice in trees and shrubs: planting to make sure plants get the best start in life. Watering, feeding and mulching will all keep plants healthy, as will paying attention to soil health.